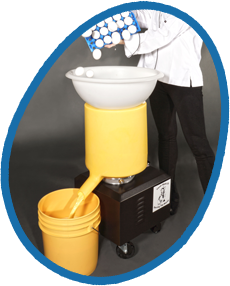 This money making and egg breaking machine will crack and extract 100 % liquid from fresh eggs of any size. Having a clean and sanitized egg, is the first step when using high quality fresh eggs. The revolutionary Egg Breaking and Separating unit can handle as many as 3000 fresh shell eggs per hour. The Egg Breaking and Money Making Machine. Clean your eggs before breaking them. Breaks and separates yolks from whites. We would like to thank you for your interest in our family of Egg Cracking, Separating and Washing machines. As you know, making a profit in the food service and baking business begins with your buying and processing ability. The challenge being, controlling food and labor costs, while consistently maintaining top quality. The Centri-Matic III and Egg Valet can save you hundreds of dollars in food and labor costs from day one, thus generating greater profits. The egg is one of the most frequently called for ingredients in food and baking recipes. When first introduced, processed egg products became a trade off for convenience and labor savings. The quality fell victim to the labor savings. Why, because of natures perfect package, the egg shell and the inherent cost of hand cracking. The Centri-Matic III and Egg Valet will crack, extract and blend thirty dozen eggs, of any size, every sixty seconds with the same consistency each and every time. You will see an increase of 10% to 15% more yield over hand cracking plus the additional savings in labor. If you are now using a processed egg product, you can go back to using high quality fresh eggs and save .15 to .50 cents per pound on product cost. The savings can easily pay for these machines in a matter of months, based upon your egg usage. 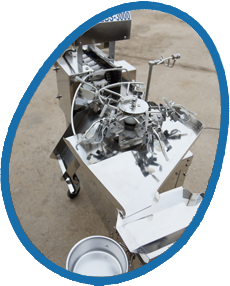 The SEW 800 Egg Washer and Sanitizing Unit will give you a clean sanitary shell egg ready for processing. 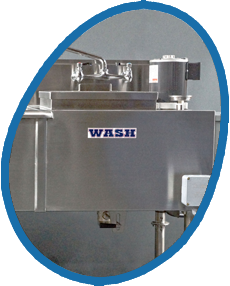 This export model can wash and sanitize as many as 3600 shell eggs per hour, while safely preparing your eggs for processing and distribution. To register your product, please click below.